Plans have been published by Basingstoke and Dean Borough Council to extend the speed limits on road coming into and within Whitchurch. Full details can be downloaded by pressing here. In outline the 30mph limit on Winchester Road will move some 200m out of town to just beyond Webbs Farm Close and the 40mph limit approximately 100m to beyond Tufton Barracks Cottages. On Newbury Road, the 30mph limit will move some 200m to just beyond the layby. On Andover Road the 30mph limit will move some 350m to beyond the A34 flyover to where the town sign is now located. Residents of the Weir will no longer be able to travel legally at 60mph along their road as this will now fall inside the 30mph limit. If you have any comments contact Barry Ford on 01256 845592 before 2nd November. All that is now required for a safer town is for motorists to observe the new limits! For what is believed to be the first time, three outlets in Whitchurch have made it into the 2007 edition of the prestigious Good Beer Guide, published by the Campaign for Real Ale (CAMRA) Entries are selected by local members of the CAMRA, who check the pubs several times each year, unlike many other guides there are no fees for listing. From over 250 pubs in the North Hampshire area only 24 are chosen by a rigorous selection process that includes regular mystery visits and quality reports throughout the year. Whilst beer quality is paramount, the guide also lists details of family facilities, entertainment, food, history and architecture. It is rare that Clubs gain entry so it is particularly pleasing that the Longmeadow Sports and Social Club has been selected. It becomes only the third club in the North Hampshire area to ever be selected throughout the 34 annual editions of this best-selling guide. John Buckley of CAMRA says that this fine venue is often overlooked but is a credit to the town with excellent facilities. Now the quality of its traditional ales have also been recognised. The ales are usually from Hampshire Brewery and Fuller's. The White Hart is another new addition. Since being under Arkell's ownership the ales have improved enormously and the fine beers from this family brewer are a result of their commitment to tradition and high quality. The third entry is the Prince Regent, known for its friendliness and "local's" atmosphere. Here you will always be engaged in conversation while being able to sample brews from Stonehenge, Hop Back at Otter breweries. 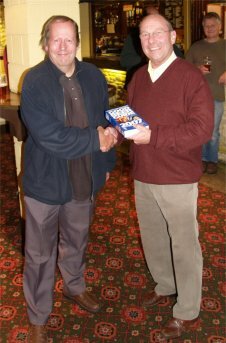 To mark the publication, the book was launched in North Hampshire at a special evening in Longmeadow Sports and Social Club, where John presented Brian Hand, Chairman of the club with a copy of the Guide. Friends of Whitchurch Silk Mill Have New Officers! At the AGM of the Friends of the Silk Mill held on Friday. The Friends were successful in finding a Chairperson, Treasurer and Secretary. The committee is responsible for managing the affairs of the Friends which includes membership, co-ordination of the volunteer programme and organising visits/events to provide revenue for a support fund. The fund is used to support projects identified by the Silk Mill management. More help is always needed, so, if you would like to help or want any more information please contact Ian Marshall by phone 01264 772385 or . Another example of the use of the Millennium Meadow was witnessed by a small group of early morning walkers (and their dogs) on Sunday as the sound of a high pressure gas burner was to be heard. 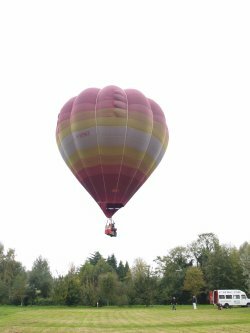 A rare Easterly wind saw the start of a long range balloon trip. The van pictured to the left set off in hot pursuit and the ground crew were reunited 4 hours later 10 miles East of Carmarthen in Wales with ballonists Jonathon and Jon. More pictures of the preparation for the launch are on the Meadow pages. A report from the baloonists is here. Whitchurch Town Council and Basingstoke and Deane Borough Council are working together to stop the unpleasant and hazardous problem of dog mess in the Town’s recreation grounds, open spaces, and on pavements. With the help of the Basingstoke and Deane Street Care Officers and Dog Wardens the campaign is to be launched by the Mayor, Cllr. Hugh James on Friday 27 October and will run for one week. Dog Wardens surgeries will be held on Tuesday from 1.30 p.m. to 2.30 p.m. and Friday 3rd November, from 10.00 a.m. – 11.00 a.m. Local dog owners can receive useful information and the added bonus of poop bags and doggy treats. The Wardens will even be able to provide an identification chip service at a cost of only £10. There will be a fun competition: “Do you know your Dogs?” Entry is open to all residents, and all ages. Pop in to the Town Hall entrance lobby for the chance to win a fluffy toy dog. The competition starts straight after the launch on 27th October, and all entries must be posted in the box provided at the Town Hall, by no later than 12 noon on Thursday 2nd November. The prize will be presented, by the Dog Wardens, at their surgery on the Friday morning.